The hotel lobby, the American Hotel and Lodging Association, has a new summer campaign. 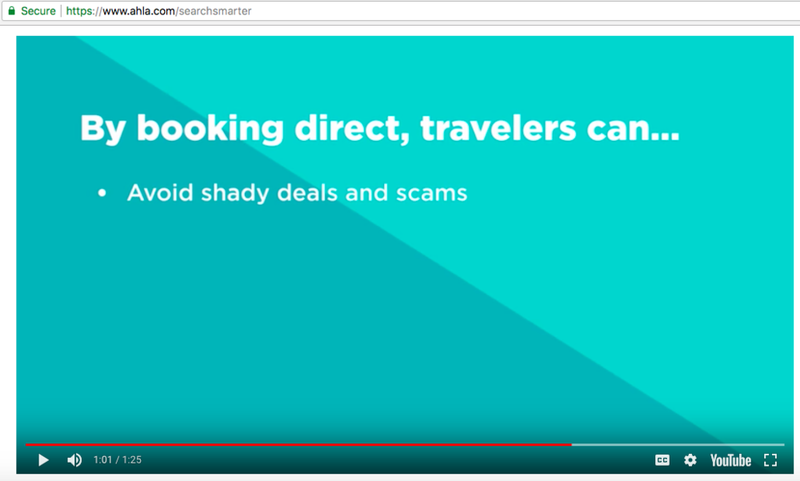 Shady Deals, also known as their Search Smarter campaign, is an effort by the hotel lobby to encourage consumers to book directly with their hotel. The campaign addresses how consumers can be confused by third-party websites selling hotel rooms that are not affiliated with hotels themselves. The internet is full of tricks. The internet is also full of helpful tools. The reason people turn to third-party booking sites like Expedia, Priceline and Hotel Tonight or actual travel agents, is so that they can compare hotels based on price, amenities and location. Consumers turn to travel agents because they trust them to make a decision based on their expertise. Consumers trust third-party hotel search sites because they can pick the best, least expensive hotel in the location they want to be at. No one is saying they should not book direct with a hotel - it's obviously a great option if a tourist already knows where to stay. If a consumer is traveling though, she often doesn't know where to stay. The internet provides many great resources for comparing hotels. This post will explore in-depth why the Better Business Bureau made a questionable decision in partnering with the American Hotel and Lodging Association. The Better Business Bureau is an organization that promotes honorable business practices. The American Hotel & Lodging Association is currently leading a campaign promoting deceptive and misleading hotel pricing, an issue that is currently the subject of a 47 Attorneys General investigation and that has been called "harmful to consumers" by the Federal Trade Commission. It seems that to deflect attention from those efforts, the American Hotel & Lodging Association has partnered with the Better Business Bureau to encourage people to book direct to improve their image and help increase the hotels bottom line. Why is the hotel lobby apparently waging a war against Expedia, Priceline and travel agents across America? Hotels want to make more money. Each hotel room booked on a third-party website or through a travel agent means that the hotel has to pay commission on that rate. The hotel gets all the money if consumers book direct. Say a consumer uses Hotwire to compare hotel prices and locations and finds one that fits exactly what he needs for $100. If you book with Hotwire they get a commission. Hypothetically, let's say it is 20%. So Hotwire gets $20 and the hotel gets $80. If a consumer books direct, Hotwire gets $0 and the hotel gets $100. The hotel lobby exists to help hotels make money. Hotels and the hotel lobby make more money if you book direct, so that's their new campaign. The Search Smarter campaign goes beyond trying to encourage consumers into trying to book direct. The campaign itself says that if you book directly with your hotel, you will "avoid shady deals and scams." That may not be true. Consumers will absolutely not avoid all shady deals and scams if they book direct - in fact, they may find more scams and not have the option of a middle person to help them through any pricing issue (as with a travel agent or third-party booker). This campaign mentions many hotel scams that hurt the hotels bottom line yet they purposefully leave out another scam. Hidden hotel resort fees that hurt consumers, but help hotels, seem to have been completely left out of this campaign. The hotel lobby seems to be intentionally trying to make third-party bookers the enemy of all travel frustrations. There are obviously some bad apples out there but the giants - Expedia, Priceline - that millions of Americans use every day allow consumers to compare hotels. Booking direct does not allow consumers the opportunity to compare two hotels. It is clear from this campaign that the hotel lobby does not want people to be able to price shop between hotels. Why? Hotels themselves are currently engaging in the most deceptive pricing ever seen. The American Hotel and Lodging Association defends hotels breaking their room rates in half, advertising only half the rate and hiding the other half as a fee. The Shady Deals, also known as Search Smarter campaign, seems to have been launched at The Knickerbocker Hotel in New York City around May 19, 2018. The hotel lobby has long encouraged people to book direct but seems to have a new summer push recently. Curiously the New York Better Business Bureau and the American Hotel and Lodging Association (the hotel lobby) partnered to host an event for journalists to promote the campaign. (I don't know what that means but I am going to guess it means they were paid a lot of money by the hotel lobby to push the hotel lobby's talking points). 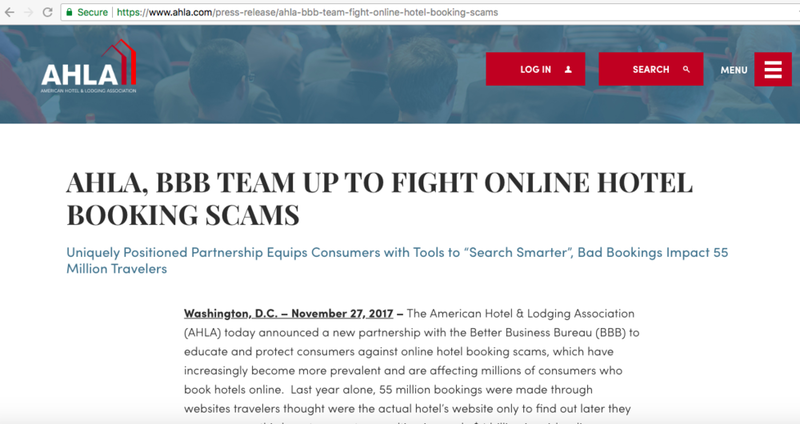 I am highly confused as to why the Better Business Bureau would partner with an organization whose main goal is not to protect consumers but to increase hotel profits. I can only hope the Better Business Bureau was naive and did not know of other campaigns simultaneously run by the hotel lobby before they joined with them on this one. The hotel lobby represents hotels and works to make them as profitable as possible. It seems very odd that an organization like the Better Business Bureau that claims to further better business practices would partner with an industry group that currently has another campaign advocating for deceptive hotel pricing. Here is the link to the American Hotel and Lodging Association's resort fee campaign: https://www.ahla.com/issues/resort-fees. Hidden hotel resort fees are spreading like wildfire across the nation. "Resort fees" are used by hotels so that they can lie about their advertised price. Hotels simply split their rate into two - they advertise half of it and they hide the other half as a fee. These fees are subject to a 47 Attorneys General investigation into deceptive and misleading pricing. Marriott was recently subpoenaed by the DC Attorney General as a result of these deceptive and misleading fees. Hotel resort fees are hated by consumers and they are being blamed for a drop in tourism to Las Vegas. The hotel lobby tries to pretend these fees do not exist at many hotels but that is not true. There were 14 hotels with hidden resort fees in New York City in 2016. Today in May 2018, there are 86. In Las Vegas, many hotels advertise rooms that cost less than their undisclosed resort fees. These deceptive fees are usually called resort fees but they can also be called an urban fee, amenity fee, destination fee or property fee. These fees often have even wilder names so consumer advocates like myself have trouble tracking them. These fees do not only deceive consumers, they also cut commissions from travel agents. Hotel staff who work at hotels with resort fees report earning less in tips (as people think these fees are for service - they are not). Perhaps worst of all, many hotels split the rate in two and only tax half of the rate at hotel occupancy tax. The other half of the rate they tax at a lower sales tax rate. That means a city like New York loses over $10 million dollars a year in lost tax revenue due to deceptive hotel resort fees. Hotel resort fees are so reprehensible there is almost no record of a hotel going on record in print or on air to defend them. They leave that to the hotel lobby. Defending the indefensible - hidden and deceptive hotel prices - has kept the hotel lobby busy recently. See here, here, and here. An example of a misleading and deceptive hotel resort fee? We can see a true shady deal if we attempt to book direct with The Knickerbocker Hotel, where the Search Smarter/Shady Deals campaign was launched with the New York Better Business Bureau. Say I knew I wanted to stay at the Knickerbocker Hotel so I went directly to their website. Ok well now I know I want to book so I will click BOOK NOW in the upper right corner. This is the third page into the booking process. On this page it yet again confirms the room rate is $545. Yet, if I scroll down further on the third page of the booking process the $545 room quickly becomes $663.32. Whaaaaa? How does a room advertised at $545 cost $663.32 per night? New York City does have legitimate hotel taxes. All of those are broken out - New York state sales tax, New York City hotel occupancy tax, Javits Center tax and New York City sales tax. But wait, you say, there is also a residence fee of $34.43 per night. Why is this broken out with the taxes? Just a guess, but probably because the hotel wants the consumer to think it is a tax and not part of the room rate that they broke off and hid here! Oh boy. If a consumer thought they could book direct to avoid scams, they might have to think again. This "residence fee" is a way for the hotel to lie about their advertised price. Each hotel that breaks its room rate into two parts and hides one half as a fee usually makes up some things to say the fee covers. Since you can't get out of the fee, it is not actually an exchange of service. This is simply part of the room rate broken off and hidden as a "fee." For the sake of an argument let's look at the items in this list. Since it is 2018, every single person arriving at this hotel is going to have access to a phone and will most likely only need internet. Some people may think, so this is basically a $30 internet fee? Wrong. New York State is explicit in saying that hotels cannot tax internet access. This is due to the Internet Tax Freedom Act. So it would be against tax law for this fee to be providing internet access. Many hotels in Las Vegas are currently being sued over the claim that resort fees provide internet access. So if the base fee is $30 and the taxed rate is $34.43, what even is this "fee" being taxed as? Good question. $30 at 14.75% tax is $34.43. So it looks like the hotel is treating the residence fee as a separate room rate and taxing it at full hotel room tax (but without the Javits Center tax or the $2 occupancy tax). There are 86 hotels in New York City with deceptive and misleading hotel resort fees / residency fees and this is just one of the hotels with deceptive pricing. They all tax their hidden fees at different rates. Down the street from The Knickerbocker in New York City is The Life Hotel. Look at how they hide their resort fee / residence fee / amenity fee / second room rate. The Life Hotel does not just bury their hotel resort fee at the bottom of the page in the booking policies, they also call it an "NYC mandatory City Hotel Fee." At the Life Hotel, this hidden fee is only taxed 8.875% sales tax (instead of 14.75% tax). Meaning they cheat the city of 5.875% tax on every $25 fee, in every room, every single night. Why is a hotel allowed to lie about their advertised room rate, bury the second part of the room rate in the taxes, lie about it being a mandatory NYC fee, and cheat 5.875% of taxes every single night? The hotel lobby is very powerful. They have a lot of money to give to politicians. They throw fancy parties on top of The Knickerbocker Hotel to impress journalists. They have enough money to "partner" with the Better Business Bureau. The New York Better Business Bureau tweeted a picture of the event on top of The Knickerbocker. When the Kill Resort Fees Twitter pointed out the duplicity, they removed the tweet. The American Hotel and Lodging Association (the hotel lobby) left theirs up. The Better Business Bureau continues to promote and support the hotel lobby and their campaign. Today they shared on Twitter an article written in Forbes about the CEO of the hotel lobby and her view of hotel scams. All the scams mentioned in this article hurt the hotels bottom line. Not shockingly, hidden hotel resort fees, where consumers are hurt but hotels profit, were never mentioned. Not one consumer advocate was interviewed in the Forbes article. 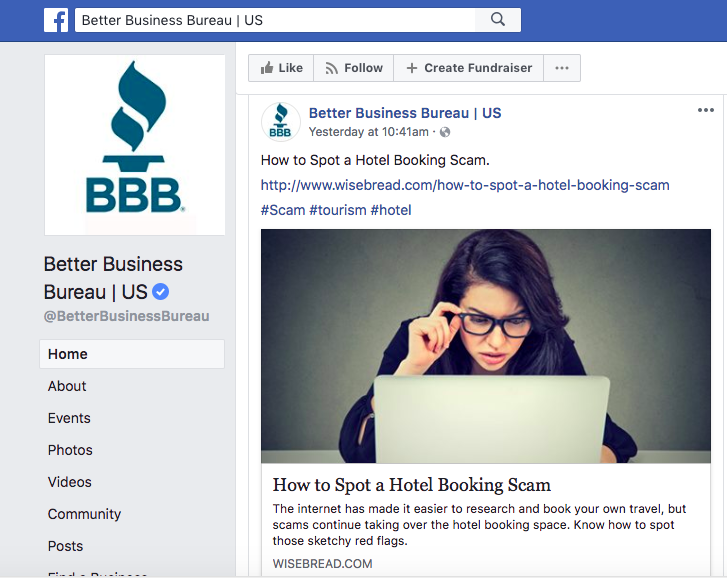 The Forbes article that only discusses hotel scams that hurt hotels was also shared by the Better Business Bureau on Facebook. Just three posts later they post yet another article preaching the hotel lobby's talking points. Again, every scam mentioned in this article hurts hotels. No scams where hotels profit but consumers are hurt are mentioned. This article posted by the BBB also throws in a scare story about Airbnb - again, a company that hurts the bottom line of hotels. Another issue of concern for the Better Business Bureau should be simply where are these articles even coming from. What journalists would only interview the CEO of the hotel lobby, and not one consumer advocate, to talk about hotel scams? Journalists who need money is one guess. Luckily some of those journalists and bloggers have disclosed that they were paid to post this content. Others do not seem to not let it be known. None of the articles shared by the Better Business Bureau have had an #ad tag next to their content. These articles could be undisclosed ads for the hotel lobby. Even if the articles the Better Business Bureau has shared are not properly labeled, that is a minor offense compared to the egregious one of partnering with an organization that is simultaneously running a campaign of deceptive pricing. Any organization that advocates for trust should not partner with an organization that runs an advocacy effort to allow hotels to not advertise their full price. The first step to avoiding shady hotel deals is to avoid shady hotels. The Knickerbocker Hotel in New York City splits their room rate into two parts and only advertises half of it. The Better Business Bureau apparently partnered with the hotel lobby on a campaign designed to beat up on third-party bookers like Priceline and Expedia that allow customers to comparison shop based on price. On behalf of all people who want better business practices in America and fair hotel pricing, we strongly encourage the Better Business Bureau to find another partner - one that actually is concerned about the consumer.